Seahenge booked his ticket to next month's Darley Dewhurst Stakes at Newmarket with a hard-fought victory. Aidan O'Brien's apparent second string caused a minor surprise as he wore down the game Hey Gaman close home. While Ryan Moore was aboard the shorter-priced Mendelssohn, it was Donnacha O'Brien who landed the Group Two honours on Seahenge (8-1), who had only finished fifth behind Expert Eye in the Vintage Stakes at Goodwood. Mendelssohn was one of the first beaten while Seahenge came with a strong challenge to pip the gritty Hey Gaman by a neck. Mythical Magic was third. O'Brien senior, enjoying a second Champagne triumph after Westphalia in 2008, said: "Donnacha won his maiden on him at Naas and he was very green. He's a big horse and then he went to Goodwood. Ryan rode him and loved him, but said he was very green and babyish. Obviously he learnt a lot there. "Donnacha gave him a lovely ride today and he came home well. He won very well and you'd be delighted with him. "Donnacha went out to teach him a lot and educate him like we do with all our two-year-olds. "They didn't go very fast so he did well to win." 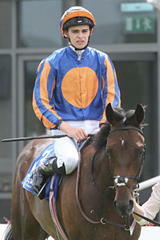 He added: "With him we came here thinking he could be one for the Dewhurst and that looks the obvious next step. "He'll be suited by better ground." The winning rider said: "He was very aggressive going down to the start, so I wanted to take my time with him. "They went a nice gallop so got a lead and he stayed on well. "My lad will be suited with stepping up in trip again and I think he's a nice horse. "He's still a bit babyish but has plenty of ability." James Tate, trainer of the runner-up, said: "I'm delighted and gutted at the same time, that's what second is all about. "He's run a cracker and a career-best, but we've just met one that was able to quicken by us today. "He could try something like the Racing Post Trophy, but that was his seventh run today so I will probably put him away. "He's just run off 548 Kilos and he's got bigger as the season's gone on. He'll definitely be a better horse next year. "I nearly didn't run him today as he really does prefer it softer than this. With a horse that likes soft ground, you have one eye on many races. "He'll never run on ground with the word 'firm' in it and ideally he wants the word 'soft' in it."